It would be easy to panic after City closed our 8 point lead down to just 2 points today - and in such emphatic style that should it come to goal difference the title will not be heading to Old Trafford - but looking at the fixtures there is no reason for the reds to worry just yet. Wins against Villa tomorrow and Everton next Sunday should be enough to secure title number twenty. Not mathematically of course, but if United arrive at the Etihad on April 30th 5 points ahead the hard work will have been done. For City, the Derby represents one last chance to reel in the reds. United on the other hand will be hoping to make it an irrelevance. Just as in 2007/08 when United went to Stamford Bridge late in the season with a deliberately weakened team, Sir Alex will be hoping that come Derby day his team have the required points cushion to absorb a defeat. 4 points would be enough. Wins against Everton and Villa would ensure a 5 point cushion at least. Not to be disrespectful to either Swansea or Sunderland - who United face after the Derby - but if any of us were told at the start of the season that we'd have to beat those two to win the title we'd have been delighted. As it stands we can afford to lose the Derby. 6-1 or 10-1; any score they like as long as we win the league. Of course I don't want to sound over confident - I am not - and I still fear that Everton at home may yet be a tricky match, but 6 points over the next week will go a long way to putting our nerves as ease. 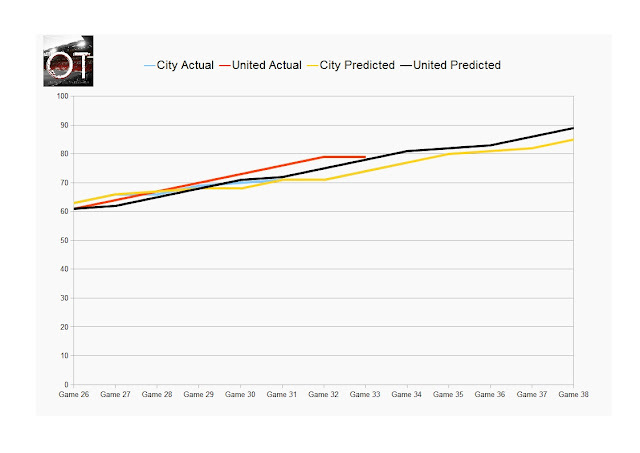 the predictor shows city's actual and projected performance converging. United are ahead of the curve.